Remote Dataset: Column Fields not "Remote" configurable? As in the manual I configured a remote dataset. When testing data I get a respons. Now for step two: Configure Columns. In the manual it suggests that three TYPE of column should appear: Value, Fomula and Remote. Remote doesn’t appear. This happens editing the first (excisting) columns “Col1” and when I try to create a new one. Working on CMS version 2.0.1, Win10-64 and Docker 17.09. 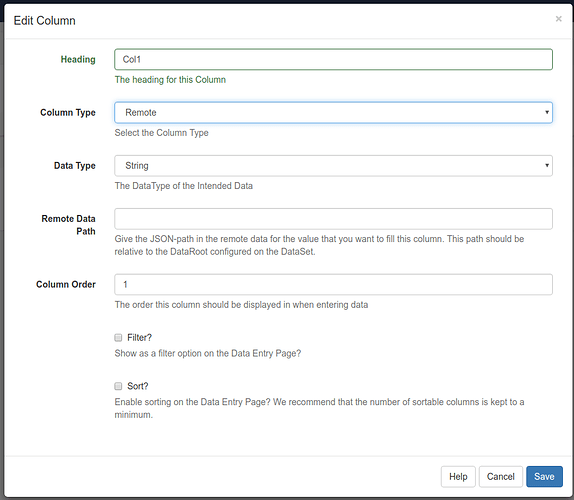 You can change the Column Type to “Remote”, and then you can configure the Data Type and Remote Data Path as needed.